A new report finds that safe water and sanitation are increasingly unaffordable for millions of Americans. In Lowndes County, Alabama, thousands of people live with raw sewage in their yards or near lagoons of human waste. Only 20 percent of the county’s residents have access to municipal sewers, leaving them responsible for maintaining their own septic systems. The soil in the former cotton-producing region is made of clay, which doesn’t drain well, and above-ground septic systems can cost up to $30,000—an impossible sum for many residents, 27 percent of whom live below the poverty line. Between 40 and 90 percent of homes in the county have failing systems or none at all. Recently, researchers at the Baylor College of Medicine found evidence in residents of intestinal parasites, including hookworm, a tiny, four-fanged nematode that spreads from human waste to the soil and back again to the human body through the skin, particularly bare feet. Lowndes County is one of several areas highlighted in a new report from the Unitarian Universalist Service Committee titled “The Invisible Crisis: Water Unaffordability in the United States.” The report documents the impact of rising water costs and inadequate infrastructure, which are putting millions of people at risk for shutoffs, illness, foreclosure, and even of losing their children, as lack of running water can be considered child neglect in 21 states. Those affected are disproportionately poor people of color, because of historic underinvestment in those communities. “US water and sewer infrastructure, much of which is over 80 years old, has often excluded low-income and minority neighborhoods and towns, Native-American communities, and low-income rural areas,” reads the report. "There is no federal statute or policy in the United States that ensures access to water for the poor." The cost of water and sanitation services in several major US cities rose more than 40 percent between 2010 and 2015, outstripping the rate of inflation. About 15 percent of all Americans may struggle to pay their water bills, though an exact figure is hard to come by since no government agency collects data on affordability. According to UUSC, water costs account for 5 to 20 percent of what the poorest 20 percent of Americans earn each year. In Seattle, for instance, the 94,000 people who live below the poverty line pay an average of $3,720 a year for water service, or at least 15 percent of their income. 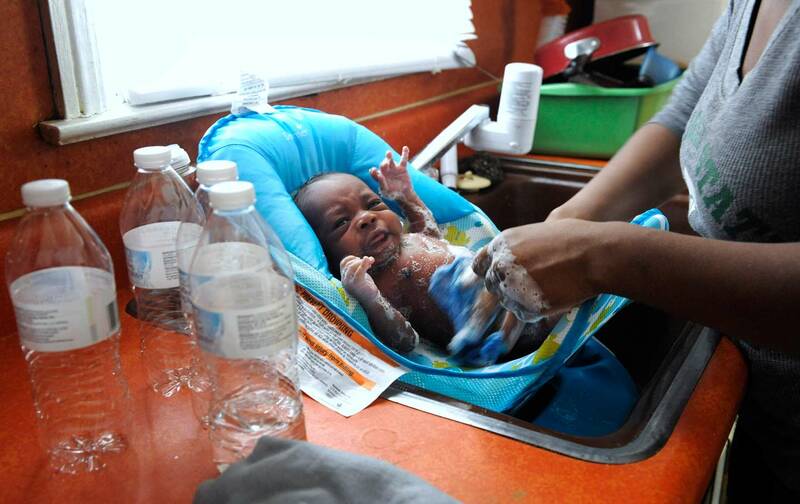 In Detroit, tens of thousands of people have had their water turned off in recent years. The mass shutoffs began in 2013, after an emergency manager took over the city and hired a contractor at a cost of $5.6 million to disconnect service to residential homes; commercial properties with tens of thousands of dollars in water debt were largely ignored. The shutoffs were a factor in at least a dozen cases where children were taken from their parents despite there being no other allegations of child abuse, according to the UUSC report. Alice Jennings, a civil- and human-rights attorney who represents Detroit residents in a class-action suit over the shutoffs, said they’ve created “a major humanitarian crisis.” But the situation with regard to water affordability, accessibility, and safety is similarly bleak in Flint, Michigan, and in many other low-income communities around the country, Jennings argued. Not only was Flint’s water poisoned; it was also among the most expensive in the country. “We are very, very in need of a comprehensive civil-rights act” that applies to water, said Jennings. Rural residents can be stuck paying for water that makes them sick, because it’s been contaminated with agricultural and industrial pollution, or to fix sewage infrastructure problems like those in Lowndes County. The report describes the impact of petrochemical plants on the water in African-American communities in Louisiana, and of water contamination from pesticides, herbicides, and fertilizers in California, which affects migrant farmworkers in particular. “Rural families have been left behind to deal with this problem on their own,” said Catherine Coleman Flowers, the executive director of the Alabama Center for Rural Enterprise and a Lowndes County native who is leading an effort to improve wastewater systems there. “This is the starkest example of inequality in this country,” she continued. The UUSC’s report, while appalling, is not the first to shed light on US water issues. In 2011, the UN’s special rapporteur on drinking water and sanitation addressed high water prices and wastewater problems in the United States, and recommended that the nation “adopt a mandatory federal standard on affordability for water and sanitation.” So far, the federal government has not responded, though some steps forward have been taken at the state and municipal levels. California declared access to water to be a human right in 2012, and last year, Philadelphia approved an income-based payment system that bases poor resident’s bills on their ability to pay. In response to the Flint crisis, Michigan lawmakers have introduced a package of legislation that includes an affordability plan, shutoff protections, and water as a human right. Addressing the high cost of water is a particularly urgent task in the face of climate change. Drought could raise the price of water significantly in some areas—as it has in California, where the state’s right-to-water law has not insulated low-income communities from price spikes in certain districts—while extreme weather events in others could overwhelm already-weak wastewater infrastructure. The report makes a number of recommendations, including the establishment of affordability programs “at all levels of government” to keep water and sanitation costs below 2.5 percent of a family’s income. The report also recommends a ban on shutoffs when customers cannot afford to pay their bills, or, at a minimum, in households where low-income children, the elderly, pregnant women, and people with disabilities or serious illnesses live. More data collection is also needed, the report argues. While the moral and health grounds for improving access to drinking water and sanitation services are undeniable, there’s also an economic case to be made. 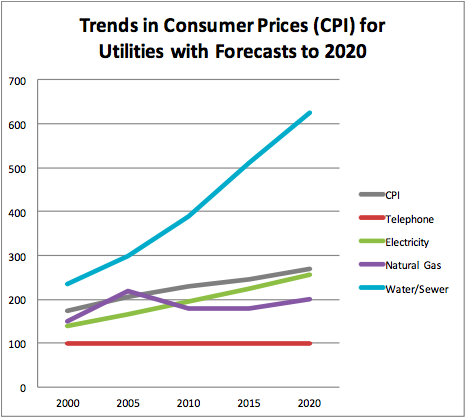 “Adopting a water-affordability program will better serve the business purposes of the water utility. No business is sustainable as a business if it’s seeking to sell a product its customer base simply cannot afford to buy,” said Roger Colton, an economist and utility-rate expert. He explained that water-affordability programs can help a city by increasing the rate at which bills are paid and decreasing collection costs, and by promoting other social benefits like stability for families and school children.